How likely is a new record high in coming days? It’s so close you can almost taste it. That’s probably what it felt like for many traders yesterday when the S&P 500 (SPX) rallied to within just a little more than 3% of its all-time (intraday) high of 2,940.91, hit on September 21, 2018. That’s less than the ground the SPX covered in just one day on January 4, when it gained more than 3.5%. (Okay, that was a pretty epic day within what has been an epic beginning-of-the-year rally.) And with the SPX having broken out above the resistance of its late-2018 and early-2019 highs, there doesn’t appear to be much in the way of a charge to the summit of Mt. New Record High. 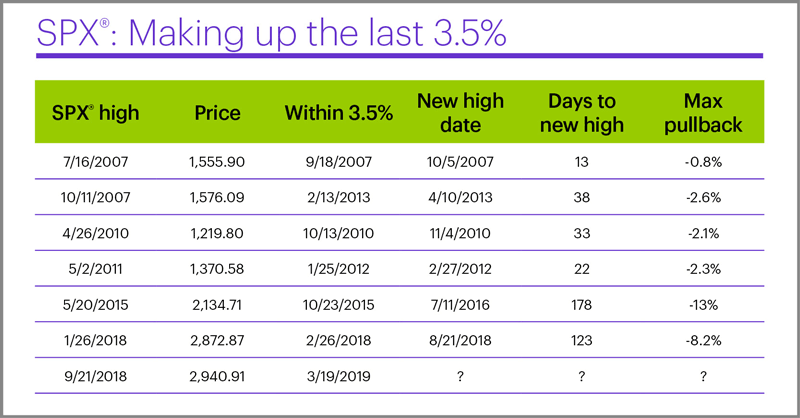 In fact, since mid-2007, whenever the SPX has rallied to within 3.5% of a one-year or longer high after experiencing a 10% or larger correction (i.e., what the index accomplished yesterday), it has never failed to rally to a new all-time high. Okay, talk to you tomorrow. Get the Champagne on ice. Of course, that’s not the whole story—it’s not even the important part of the story. Until history proves otherwise, if you wait long enough the market will always make a new record high—a comfort for extremely long-term investors, and a somewhat irrelevant factoid to traders. The question right now is, how long has it typically taken the SPX to push to a new high after coming within 3.5% of the previous one? For example, the SPX hit 1,555.90 on July 16, 2007 and, after a correction, rallied to within 3.5% of that high on September 18. It traded to a new high (above 1,555.90) on October 5, which was 13 trading days later, and its maximum decline between coming to within 3.5% of the old high and rallying to a new one was -0.8%. If the table contained only the first four entries, you couldn’t blame anyone for thinking the SPX stands a good chance of making a new all-time high sometime in the next three to eight weeks, and that it will experience only a small pullback (say, perhaps in the 1–3% range) in the process. The last two entries, which show how the market recovered after the May 2015 and January 2018 highs, are much different. 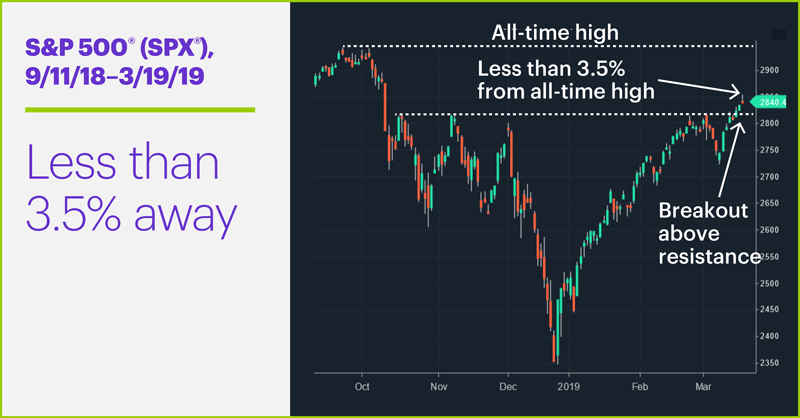 The SPX first traded to within 3.5% of its May 2015 high on October 23, 2015, but it wasn’t until July 11, 2016—178 trading days later—that it pushed to a higher high. It also suffered a -13% downturn before it got there. A new S&P 500 all-time high is tantalizingly close, but that doesn’t mean it will be a straight shot from here to there. Last year was a similar story: It took the SPX only around a month to rally to within 3.5% of its January 26 all-time high, but it didn’t actually top it for another 123 trading days, on August 21. And it also suffered a fairly sharp pullback (-8%) along the way. The lesson: Yes, the SPX will—someday—make a new all-time high. History, though, suggests it could take anywhere from a few weeks to several months (or longer) to do it, and you can’t rule out another downturn before it gets there. And what happens after that is another story entirely. The SPX’s all-time high appears tantalizingly close, but that doesn’t imply a one-way market for the near future. Experienced traders always look both ways before they cross the street. Market Mover Update: Match Group (MTCH) extended its upswing with a 2%-plus rally yesterday (see “Looking for love”). Today’s numbers (all times ET): EIA Petroleum Status Report (10:30 a.m.), FOMC announcement (2 p.m.). Today’s earnings include: General Mills (GIS), Five Below (FIVE), Micron (MU), Wheaton Precious Metals (WPM).